With 2008 coming to a close, I was recently reflecting on the heartfelt giving that I have witnessed, heard about or participated in this past year. If our world is going to improve and escape this economic crisis, giving (in a variety of forms) will be one of the main reasons why. The manner in which friends and acquaintances have worked with youth has inspired me. Three of my youth basketball program volunteers and I took 6 young men (ages 16-21) out for dinner in early November. It was wonderful to talk and laugh about our experiences and listen to their dreams. The way in which thousands of people volunteered with the Barack Obama campaign was refreshing in that they helped to bring about a much needed change in the USA and around the world. They were moved by the spirit of Obama and that energy will be needed again as our President-Elect will likely have a “call to action” for all Americans to take giving to new heights. Giving of one’s self or time is something we should do on a consistent basis throughout any year. Not only does it feel good; it also stimulates one’s community in a positive way. a) Your neighborhood - Help youth in your neighborhood by teaching them a sport, about music or taking them to a museum. An acquaintance started a musical program in a NYC school that culminated in the kids being taken to Sweden to perform. They had an unbelievable experience with many being outside of NYC for the first time! b) Vacation - If on vacation in a city, take a few hours to bring small gift to kids suffering with cancer or pitch in at a homeless shelter or visit an elderly facility. Even when not vacationing, these are positive ways to contribute. One of the most beautiful sights I have ever seen was a young woman singing “Amazing Grace” with a blind woman at a home for seniors. Their voices were magical and the joy in both their spirits gives me chills to this day. c) Mentor - Be a mentor for a young person or someone in your own family. Everyone should have at least one mentor and often young people find it difficult to ask for or don’t recognize a quality mentor when they meet one. I have several mentors including an uncle, an ex boss, my first basketball coach and several friends. My life wouldn’t be as successful without their guidance and wisdom; some being mentors for over 20 years. d) Volunteer to teach a class at a local school - This is one of the simplest ways to help young people and one that can elude our thoughts. A school in your area will usually let a person come talk to a class if asked. You can talk to them about your passion, teach them a skill you have mastered or ask what questions they might have. In addition, passing along thoughtful insight about business is always good for our youth to hear! Some of my most memorable moments occured while teaching a class of 10-11 year olds. e) Hug or a Smile – Giving is not only towards the youth, less fortunate or elderly. Sometimes, we must take the time to give family, friends, or colleagues a heartfelt hug to show them how much we appreciate them. We don’t (myself included) hug enough and it is one of the easier things to do in life. Also, a smile typically goes a long way even to a complete stranger. f) Help a colleague at work – Some find it difficult to help those they work with for fear of that person doing better or being competitive. Lending a helping hand for a colleague will typically be good for anyone even if the person helped rises to higher levels. One day, that person may lift you up! g) As Americans, we must reach out to the world – Less than 25% of Americans have passports and that is a shame in my opinion. How can we learn about our brothers and sisters in this exciting world if we don’t visit a foreign country now and then? Get that passport and try a slice of a different culture. There are so many beautiful people and interesting places to see if we only open your eyes. h) Use your automobile for people in need – There are people who need to visit a doctor, get groceries or receive treatments for an illness but cannot do it themselves so they need someone to drive them. My mother is one of those who give assistance of this kind and she currently drives for those in need. If this interests you, inquire in your community and you may find that your help is sorely needed. 2008 has been brutal in terms of the economic chaos in America and throughout the world. The financial and job losses have been disheartening and the future will be grim for at least a few years BUT I am still hopeful that we can turn these challenges around and return to those exciting years in the 1990’s IF we as Americans and the global world take GIVING to a new level. One of the ways we can begin this new level is too do something slightly different for the holiday season this year. Take a day and volunteer in your community or invite someone to spend the holidays with you that might otherwise be spending it alone. How about presents to those less fortunate in place of the often far too many gifts we give each other? If you are able, make your kids a part of this effort so they can begin to understand and see the power of a loving and giving spirit. Use your creative juices to find a task you like and will benefit someone or something and DO IT during the holidays. If you make the effort, you will feel fulfilled and satisfied inside your soul and that will make time with your family much more special. Below is an article about volunteering this holiday season that may inspire you the way it touched me. I am hopeful and optimistic that we can fight through these tough times and become better than ever in future years. As our individual communities and countries improve, the world will become a happier and more productive place. I plan to step up my giving (in Sweden and America) and encourage others to do the same! I hope you will join me. Giving is now more important than ever. We must all do our part if this complex global world is going to thrive. What role are you going to play? Happy Holidays and Happy Gswede Sunday! 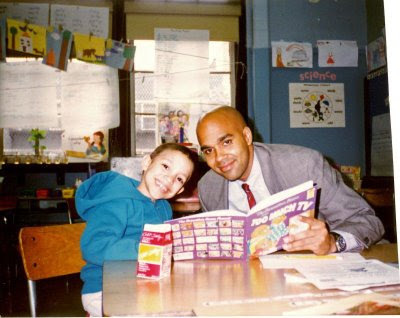 Volunteering in 1996 in "Everybody Wins" program in NYC. The program matched corporations with local schools. I read to and explored language/stories with Luis every week for 1 school year. One of the hightlights of my life! this was absolutely great george! what goes around comes around, as simple as that.